This fully adjustable mounting system is designed to handle high thrust conditions to minimize engine vibration in high demand applications. Trunnion mounts can be configured in single, double or triple arrangements, subject to thrust demand. Custom bracket design is available, allowing it to fit most gearboxes on the market. No shimming is required: these are fully adjustable with easily accessible CAM adjusters. 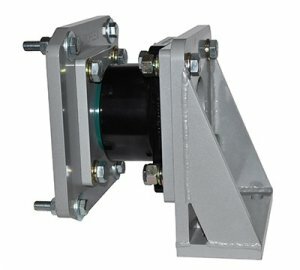 The Isoflex trunnion mounting system is designed to isolate engine vibration in tugboats, towboats, patrol vessels, ferries, yachts and super yachts.